n 2013 AAD pursued its program Refugees on the Move in the Central African Republic, despite political unrest, benefiting 3,000 refugees. Deemed a success, the program was replicated in Tanzania and Burundi. Echoing the Millennium Development Goals of increasing primary school enrollment, AAD launched in 2013 its newTownship Orchestra project in a high school in Cape Flats on the outskirts of Cape Town in South Africa. Learning and practicing music are indeed very effective factors of integration and academic achievement for students in the townships. 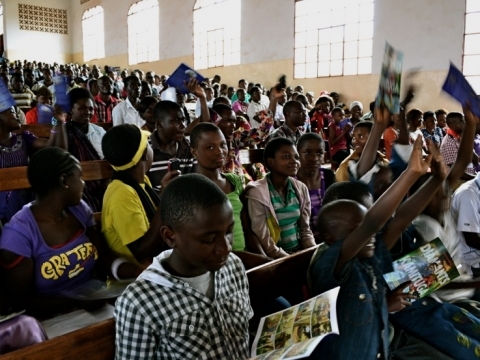 Throughout 2013, AAD has continued its campaign against AIDS in the DRC by organizing many concerts. Via music, messages of prevention and awareness are shared with tens of thousands of young Congolese and screening rates have multiplied four-fold. In July 2013, AAD was granted consultative status with the United Nations ECOSOC. This decision marks the international recognition of AAD’s activities and gives it legitimacy and accountability to the community of UN Member States. In 2013, more than one million Africans have received direct support from AAD. This card is dedicated to them because they are the future of Africa.